Wayne Farris (born January 25, 1953) better known by the ring name The Honky Tonk Man, is a retired American professional wrestler. He previously wrestled for World Championship Wrestling (WCW) and World Wrestling Federation (WWF, now WWE). He is best known for his first run with WWF, where he held the WWF Intercontinental Championship for a record 64 weeks, and lost it to The Ultimate Warrior at the 1988 SummerSlam. He is the cousin of fellow professional wrestler and color commentator Jerry Lawler. Farris was inducted into the WWE Hall of Fame as part of the 2019 induction ceremony. Farris began his career in 1977 working in Malden, Missouri and wrestled alongside his training partner Koko B. Ware for promoter Henry Rogers. Farris then moved on to Memphis Wrestling in 1978. He wrestled frequently in Birmingham, Dothan, Mobile, and Pensacola as "Dynamite" Wayne Farris. Starting out as an undercard wrestler, he later achieved greater success when he teamed with Larry Latham to form The Blond Bombers when they were put together by Gerry Brisco in Florida Championship Wrestling. The Bombers were later put with Sgt. Danny Davis as their manager when they came back to Memphis. 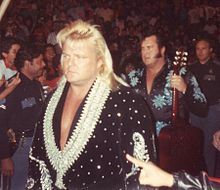 The Blond Bombers were involved in heated feuds with several fan favorite teams across the two competing Tennessee promotions, appearing in both Nick Gulas's Nashville based territory, and Jerry Jarrett's Memphis area. Their signature moment was the now famous "Tupelo Concession Stand Brawl" against Jerry Lawler and Bill Dundee. He then had stints in the American Wrestling Association (AWA), Jim Crockett Promotions, World Wrestling Council (WWC), Southeastern Championship Wrestling, Southwest Championship Wrestling, National Wrestling Alliance and Stampede Wrestling through the early 1980s, winning multiple singles and tag team championships in each. Farris entered the World Wrestling Federation (WWF) in 1986 under the ring name The Honky Tonk Man. Honky made his televised WWF debut on the September 28, 1986 episode of Wrestling Challenge, defeating Terry Gibbs. Originally pushed as a fan favorite wrestler with an Elvis impersonator gimmick, Honky soon cut a series of promos with Jesse "The Body" Ventura that aired on the WWF's syndicated programming asking fans for a "vote of confidence", while these promos actually insulted fans in the manner of Andy Kaufman before him. The results predictably came back negative, and it was not long before Honky turned into a cocky villain and took on "Mouth of the South" Jimmy Hart as his manager. Hart was billed as "Colonel Jimmy Hart" for Honky's matches, a reference to Elvis' manager, Col. Tom Parker. Honky's first major feud came against Jake "The Snake" Roberts, who was in the midst of a fan favorite turn. The feud intensified when Honky attacked Roberts on his talk show set, The Snake Pit. According to Roberts, Honky was supposed to hit him with a gimmicked balsa wood guitar. Roberts believes Farris accidentally grabbed a real, non-gimmicked guitar and smashed it across Roberts' back, legitimately injuring him, and starting him on his dependence of prescription pain medication (in an interview, Roberts alleges that he was picking pieces of the guitar out of his back for weeks after he was hit). This has been disputed as Roberts had been a known drug user years before this incident. However, in an interview for World Wrestling Insanity, Honky disputed Roberts' assertion saying, "That's not true and, in fact I attribute most of that to Mick Foley, who wrote about it in his book, and Jake, who lied about it", although television footage of the incident showed that the guitar did not break like a gimmicked one would have and that it took several more hits to Roberts' back for the guitar to break apart. Yet Roberts continued to wrestle regularly following this angle bringing into question the alleged non-gimmicked guitar shot. During their feud, which culminated at WrestleMania III, Honky grabbed the ring ropes to score a tainted win; afterward, Roberts cleared the ring of Honky before he and Alice Cooper attacked Hart with Damien, Roberts' python. On the June 13, 1987 episode of Superstars, Honky defeated Ricky "The Dragon" Steamboat for the WWF Intercontinental Heavyweight Championship; Honky reversed Steamboat's inside cradle and grabbed onto the bottom ropes for extra leverage to get the pinfall win. Honky was originally meant to be a transitional champion to only hold on to the title for a short period of time. However, Roberts failed several drug tests following WrestleMania  and Honky became booked to remain champion for what would be a record-setting run. In a later interview, Honky remarked that Hulk Hogan, whom he then had a friendly, collaborative relationship with outside of the ring, had helped give Honky a chance at the title after a coincidental meeting between Hogan, Honky, and Vince McMahon took place. Hogan stuck up for Honky, even though McMahon had someone else in mind. To preserve his title, which could only be taken by pinfall or submission, Honky often got himself deliberately counted out or disqualified against challengers such as Steamboat, Billy Jack Haynes, Bruno Sammartino, and George "The Animal" Steele. Also during this time, Honky began using a 50s-styled, themed entrance song performed by Farris (included on Piledriver: The Wrestling Album II, the WWF's second album of wrestling themes). By September 1987, "Macho Man" Randy Savage was in the midst of a fan favorite turn and began challenging Honky for the title (after Honky had made comments about himself being "the greatest Intercontinental Heavyweight Champion of all time" and disparaging comments about former champions, particularly Savage). Although they had several matches beforehand – they had also met in 1986, when the then-villain Savage was champion and challenged by the fan favorite Honky – the first Savage-Honky match to air on national television was on the October 3, 1987 episode of Saturday Night's Main Event, which was taped on September 23 in Hershey, Pennsylvania. During that match, Savage nearly defeated Honky until Honky's allies in Jimmy Hart's stable, The Hart Foundation (who had interfered throughout the match), ran into the ring and attacked Savage, getting Honky disqualified. Savage's manager, Miss Elizabeth, attempted to stop the attack on Savage, but Honky shoved her down and she fled to the locker room; meanwhile, Honky completed his attempt to break his guitar over Savage's head. Shortly thereafter, Miss Elizabeth returned with Savage's former rival, Hulk Hogan, who aided Savage in running off the heels (leading to the formation of The Mega Powers). Honky continued his bitter feud against Savage, as Honky would frequently make advances toward Miss Elizabeth – including one such incident at the 1987 Slammy Awards – to agitate his challenger. The last high-profile Savage-Honky match, aired as part of the undercard to Hulk Hogan vs. Andre the Giant on the 1988 Main Event, saw Honky lose by countout after Savage rammed him into the ring post on the outside of the ring. Their feud was blown off in the weeks before WrestleMania IV through a series of tag team-style steel cage matches, involving various allies of both Honky and Savage on their respective sides and Savage usually emerging victorious. Honky retained the title in matches with Savage and Brutus "The Barber" Beefcake, Honky's next major rival. During the Beefcake-Honky feud – which began at WrestleMania IV (where Jimmy Hart got him disqualified by knocking out the referee with his megaphone while Beefcake had Honky in a sleeper hold, and this saw Honky retain the title, but Hart got a haircut from Beefcake himself) and continued during the spring and summer of 1988 – Honky vowed not to let Beefcake cut his ducktail hair, something Beefcake often said he would do in promos. In their matches, Honky was often seconded by a mysterious woman named Peggy Sue; while WWF Women's Champion Sherri Martel played the role for television tapings, more often than not, "Peggy Sue" was Jimmy Hart dressed in drag. Beefcake countered with a "woman" of his own: "Georgina" (George "The Animal" Steele in drag). Honky and Beefcake were scheduled to square off at the 1988 SummerSlam in what was billed as Beefcake's last shot at the now renamed Intercontinental Championship. However, in a storyline twist, Beefcake was thrust in a feud with "Outlaw" Ron Bass after Bass committed a sneak attack on Beefcake; the incident was aired the weekend before SummerSlam. At the event, it was announced that a "mystery opponent" would face Honky for the title. When it came time for the match, Honky grabbed the microphone and proclaimed that he did not care who his opponent was. The Ultimate Warrior then ran out and pinned his stunned opponent in just 31 seconds for the Intercontinental Championship, ending his reign at 454 days. Honky had been the champion for one year, two months and 27 days – the longest Intercontinental Championship reign in history. Honky's bids to reclaim the title were unsuccessful and he began moving down the card. In 1989, Honky began a feud against "The American Dream" Dusty Rhodes, but lost. In late 1989 and 1990, he and Greg Valentine, who was also managed by Jimmy Hart, aligned themselves as the tag team Rhythm and Blues. After competing against such teams as The Hart Foundation and The Legion of Doom, Rhythm & Blues were part of Ted DiBiase's Million Dollar Team along with his "mystery" partner, the debuting Undertaker, against Rhodes' Dream Team of The Hart Foundation and Koko B. Ware at the 1990 Survivor Series. Honky wrapped up his WWF career with a stint as a pro-villains color commentator alongside Vince McMahon and Roddy Piper on Superstars before leaving in January 1991. In Summer to Winter 1994, Honky was wrestling for World Championship Wrestling and challenged Johnny B. Badd for the WCW World Television Championship, until he left due to a dispute with management. In his book Controversy Creates Cash, Eric Bischoff stated that his favorite firing was that of Honky. Honky has responded by saying that it was an honor, as Bischoff had fired a number of people while in WCW until he got himself fired. After a brief stint in the American Wrestling Federation, Honky resurfaced in the WWF full-time in 1997 as a color commentator on Raw Is War, WWF Superstars, and Shotgun Saturday Night, and then as the manager of Billy Gunn, who had started a singles run. Under Honky's tutelage, Gunn became known as "Rockabilly", which was a short-lived and unsuccessful gimmick. Honky then made an appearance in the 1998 Royal Rumble event. Honky returned to the WWF for a one-time appearance at the 2001 Royal Rumble, but was quickly eliminated by Kane after being hit on the head with his guitar. In 2008, Santino Marella announced his intention to break Honky's record for longest Intercontinental Championship reign, usually displaying a special "Honk-a-meter" comparing Honky's 64-week record with the length of his own reign at the time. On the October 6 episode of Raw, Honky, along with Goldust and Roddy Piper, was named as one of the possible opponents for Marella's Intercontinental Championship at Cyber Sunday. He was voted in with 35% of the vote; despite concern that his injured finger might require surgery, he did appear, winning the match by disqualification (thus failing to win the title). This was the first time that he wrestled as a fan favorite in the WWE (former WWF) since he first joined it in 1986. After the match had ended, Goldust and Piper came down to the ring and, along with Honky, attacked Marella. Afterward, the three legends celebrated in the ring and shared a laugh, brought on by Honky's celebratory dance, which came to an abrupt halt due to his slipping on Goldust's wig. On the October 27 episode of Raw, Honky appeared as a special guest commentator. After an impersonation of Marella's on-screen girlfriend, Beth Phoenix, Charlie Haas was knocked into the announcer table, and Marella attacked Honky, prompting Piper and Goldust to block Marella's escape from the ring. Upon Goldust's entry to the ring, Marella turned around to be smashed over the head by Honky's guitar. Honky inducted Koko B. Ware into the WWE Hall of Fame on April 4, 2009. In 2010, WWE offered him a place in the WWE Hall of Fame, but he rejected it. Honky made a brief appearance on Old School Raw on March 4, 2013. Following a match between the team of Brodus Clay and Tensai and 3MB, he smashed 3MB member Heath Slater over the head with a guitar. He then danced with Clay and Tensai to his signature "Cool, Cocky, Bad" theme song. Since 2000, Honky has worked independent wrestling shows all over the world. Honky, along with Ryan Smith and a host of others, ran a series of controversial wrestling websites from 2000–2006. TheHonkyTonkMan.com featured frequent updates from Honky himself, a highly interactive message board community, extensive photo gallery, audio updates, and more. Notable online feuds began between The Honky Tonk Man and Jerry Lawler, Roddy Piper, and others. These often intense online rivalries became a major drawing point for fans. The website unexpectedly closed without much explanation in December 2006. The site now forwards to various new ventures of former website manager Ryan Smith, who remains tight-lipped about the closing. Honky has wrestled for Southern Championship Wrestling in Castroville, Texas, and MSW in eastern Canada. On April 23, 2008, Honky was seen wrestling in Presque Isle, Maine for the North Atlantic American Wrestling Association promotion. He appeared on Heavy on Wrestling on June 14, 2008, in Superior, Wisconsin. He wrestled as a fan favorite, defeating Big Brody Hoofer and hitting Cameron Steele with a guitar. He also appeared at PDX Wrestling (the new-age Portland Wrestling, run by Sandy Barr's son Josh) teaming with a local fan favorite against two villains. On April 26, 2008, Honky was inducted into the XWF Hall of Fame by its creator Jack Blaze at their 2008 XWF Superbrawl event. XWF was later renamed LPW (Legends Pro Wrestling) where Honky is still honored in their Hall of Fame. On June 28, 2008 in Chicago Ridge, Illinois, he made a special guest appearance for Ring of Honor with the storyline that "Sweet N'Sour" Larry Sweeney had brought him on board with his Sweet N'Sour Inc. faction. He praised the crowd and was about to sing and dance for them until Sweeney stepped in and told him he would not be doing either until their demands were met. On July 27, 2008, Honky almost had the index finger of his right hand severed during a public appearance in Canada before an Ultimate Championship Wrestling show in Charlottetown, Prince Edward Island. He was making an appearance at Boston Pizza in Charlottetown several hours before the show when someone wanted to take a photo with him with both men clashing guitars. When the guitars collided, the neck of Honky's guitar turned and sliced into Honky's finger, almost severing it. Honky was immediately taken to Queen Elizabeth Hospital where doctors stitched the finger and bandaged it. Honky made his appearance at the Ultimate Championship Wrestling show several hours later. He was unable to wrestle his scheduled match due to the injury and was replaced by Trash Canyon, whom he managed from ringside. Honky, although injured and in obvious pain, sang his theme song twice in the ring. In August 2008, Honky appeared at Wrestling Supershows across Canada. Honky also made appearances in SWCW in Oklahoma City, Oklahoma. On October 24, 2008, he wrestled for Big Time Wrestling (his first match in four months), beating L'Empereur. On January 7, 2009, he appeared in a World Pro Wrestling event in Colusa, California, teaming with Doink The Clown (a new masked version) to face WPW World Tag Team Champions The First Class Express, Jerry Grey and Mighty Henrich. The match ended in a no contest as Doink turned on Honky and the three triple-teamed him. On May 7, 2009, Honky and Bushwacker Luke defeated "Kowboy" Mike Hughes and "Wildman" Gary Williams for the UCW Tag Team Championship. On January 31, 2011, Honky made his Dynamic Wrestling Alliance debut defeating Col. Jonathan James at the "Golden Opportunity II" event in Middletown, Ohio. On June 5, 2016, Honky wrestled in Impact Pro Wrestling in New Zealand, at the Armageddon Expo in Wellington. He teamed up with Brook Duncan and Britenay to defeat the team of the IPW New Zealand Heavyweight Champion Curt Chaos, Taylor Adams and Mr Burns. Honky made a cameo appearance in the first episode of season 3 of Lucha Underground, appearing as a warden in a prison, returning Dario Cueto's things upon his release. On February 26, 2019, WWE confirmed that the Honky Tonk Man would join the WWE Hall of Fame class of 2019. He was inducted on April 7, 2019 by his former manager Jimmy Hart. Honky appeared in an episode of the court based show Judge Jeanine Pirro as a witness to the defendant; the episode, which aired on October 11, 2010, was also the highest rated show for Judge Jeanine Pirro of all time. Honky appeared in the video game WWE All Stars as a free downloadable character. He also has appeared in WWE 2K15 as part of a downloadable content pack and is in WWE 2K16 as an unlockable character from the special objectives. He was cast in John Wesley Norton's film Executive Ranks. Honky also appeared in Insane Clown Posse's music video for "How Many Times" along with The Bushwhackers and his former tag team partner Greg Valentine. Farris is a first cousin of Jerry Lawler and the late Brian Christopher. He is an avid golfer in his spare time. Farris' first marriage to Judy Lynn Nuckolls was brief, but he has been married to his current wife Tammy since 1984. He has lived in Gilbert, Arizona since June 1993. Although a kayfabe rival of Randy Savage, Farris had a professionally friendly relationship with him. Both men held the WWF Intercontinental Heavyweight Championship for over one year, with Farris beating Savage by a few weeks. 1 During Honky Tonk Man's reign by mid-1988, the title was renamed the WWF Intercontinental Championship. ^ "Amazing But True.". WWE Magazine (13): 23. July 2007. ^ "The Honky Tonk Man to be second inductee into WWE Hall of Fame Class of 2019". CBSSports.com. Retrieved 2019-02-26. ^ WWE (14 June 2012). "The Snake Pit Superstars 2/21/87". Retrieved 22 March 2018 – via YouTube. ^ "YouTube". www.youtube.com. Retrieved 22 March 2018. ^ "Kayfabe Commentaries Presents: YouShoot with the Honky Tonk Man – Scotts Blog of Doom!". blogofdoom.com. Retrieved 22 March 2018. ^ a b THE HANNIBAL TV (14 February 2015). "HONKY TONK MAN ON RICKY STEAMBOAT". Retrieved 22 March 2018 – via YouTube. ^ "Week in Wrestling: WrestleMania week is here". si.com. Retrieved 22 March 2018. ^ kelly larson (25 June 2010). "Insane Clown Posse - How Many Times". Retrieved 22 March 2018 – via YouTube. ^ "Roy Farris - Universal Life Church Ministers". Universal Life Church Ministers. Retrieved 2016-04-12. ^ "Where Are They Now? Honky Tonk Man". wwe.com. Retrieved 22 March 2018. ^ a b THE HANNIBAL TV (7 February 2015). "HONKY TONK MAN ON MACHO MAN". Retrieved 22 March 2018 – via YouTube. ^ a b c Duncan, Royal; Will, Gary (2000). Wrestling Title Histories (4th ed.). Archeus Communications. ISBN 0-9698161-5-4. ^ "N.A.W.A. Title Histories". North Atlantic Wrestling Association. Retrieved 2014-10-26. ^ "Pro Wrestling Illustrated (PWI) 500 for 1992". The Internet Wrestling Database. Retrieved 2013-11-09. Wikimedia Commons has media related to The Honky Tonk Man.